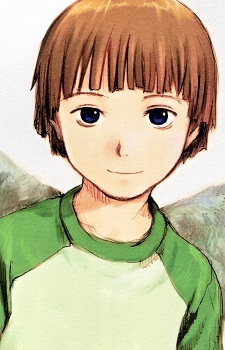 Kuu is the youngest Haibane in the older group, having only been at Old Home two years more than Rakka. She is seemingly full of boundless energy and is nearly always cheerful. Rakka and Kuu became close friends shortly after Rakka arrived at Old Home. Kuu confides in Rakka that she had wished her to be a younger sister but was happy that Rakka wound up being older than her since she would have been placed with the younger group otherwise. Kuu is curious and enjoys trying out different things, which can sometimes result in disaster. She tried Reki's scooter and crashed into a telephone pole, and when she tried Hikari's glasses she became dizzy and fell down the stairs. She occasionally works at a cafe in town and is seemingly paid in sugar cubes.